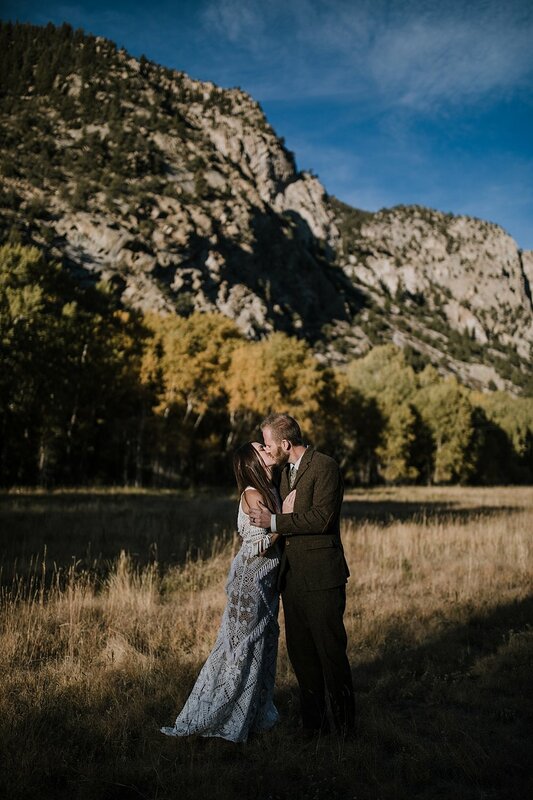 Justin and Brittany contacted me about photographing their post elopement celebration with family (they exchanged vows in Norway!) out in Nathrop, Colorado, by a little cabin amongst the woods. I was absolutely ecstatic to join in and document their story with their family. 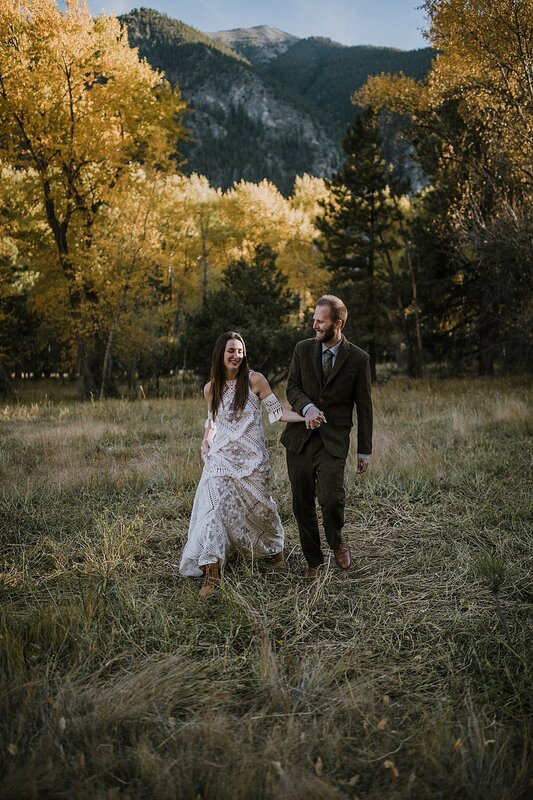 This celebration was so special as their family supported their decision to travel to Norway for their vows and couldn’t wait to have an evening of their own with the couple! 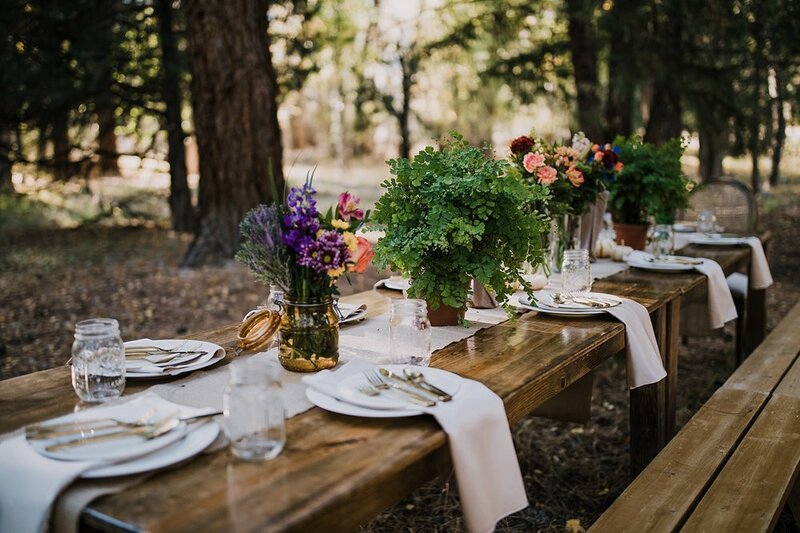 When I arrived the table was set up with flowers from the Buena Vista Farmers Market, beautiful brass silverware, and a few bottles of wine scattered about. The wooden table was placed in a small opening between the trees - aspens turning bright yellow and pine trees still green. There were a few leaves that fell with each slight breeze and the woods chattered as the sun began to hang low on the horizon. 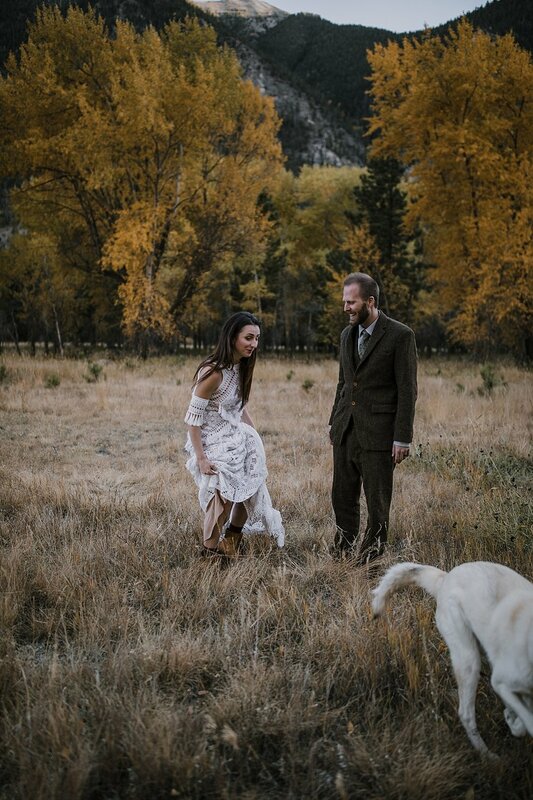 I walked with Justin and Brittany out into the meadow that sat below Nathrop and Buena Vista’s gorgeous mountains. The sunlight hitting the rocks slowly disappeared as they cuddled and kissed, and played with Nieve their sweet husky pup. Nieve was hilarious! She is the prettiest blue eyed husky and she adores Brittany - following Brittany with her eyes everywhere she goes. 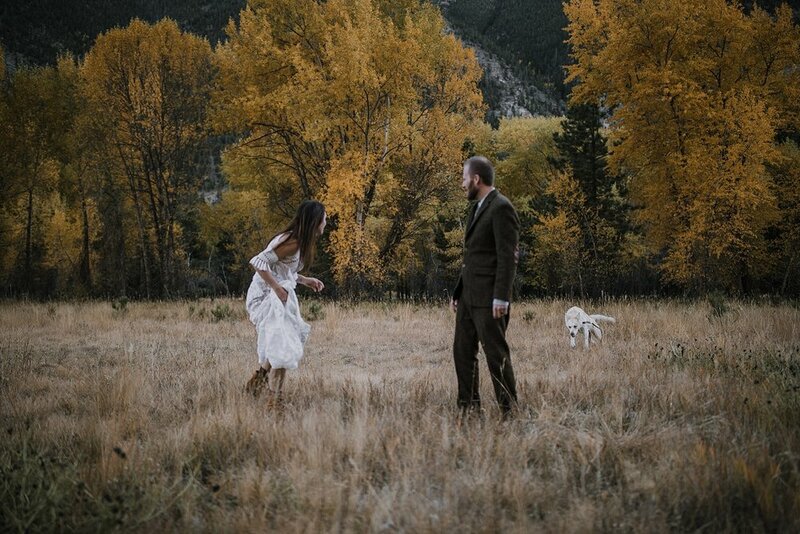 When we let Nieve loose to say hello to the happy couple she ran as fast as she could, back and forth in between them! Everyone laughed while she romped around - it’s true when they say huskies are crazy, they’re just such wild, happy, and energetic doggos! 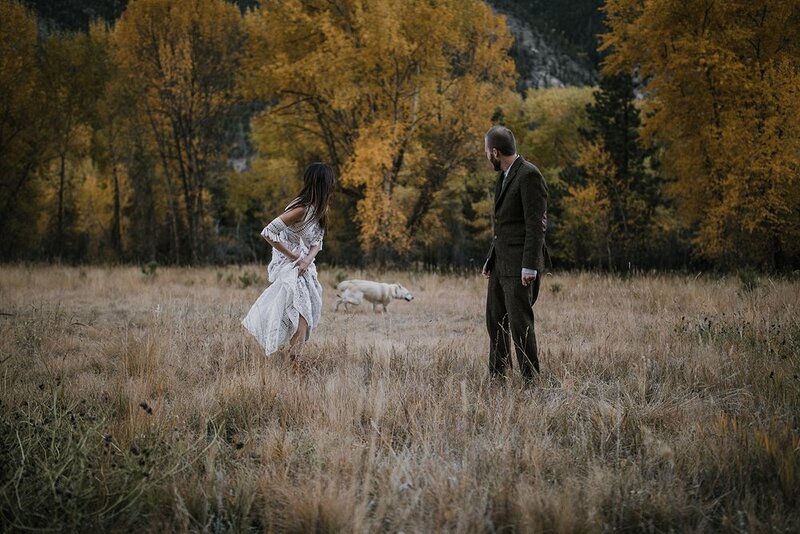 Justin picked Brittany up and swung her around in her gorgeous Rue De Seine Blake gown as we headed back to the cabin. This dress was so stunningly beautiful with it’s long train and tassels! It drifted in the wind as they gave one another a final kiss. 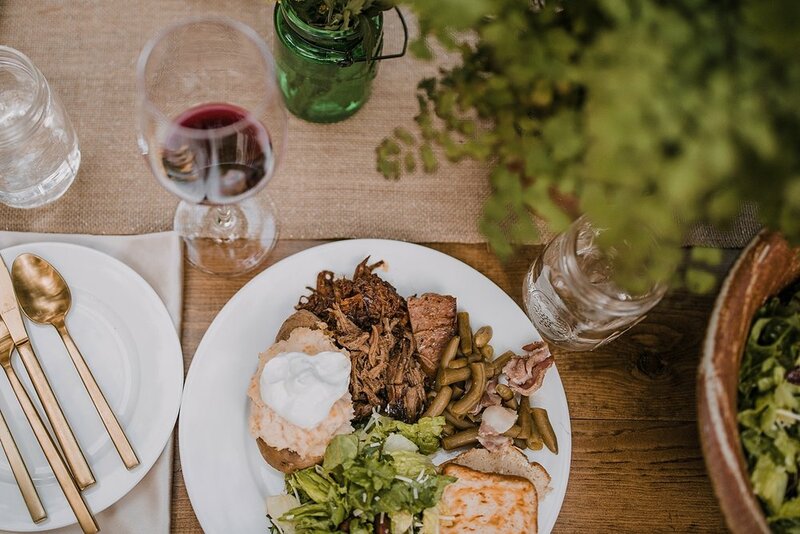 We sat down for the most delicious wedding dinner ever - BBQ from Rudi’s! 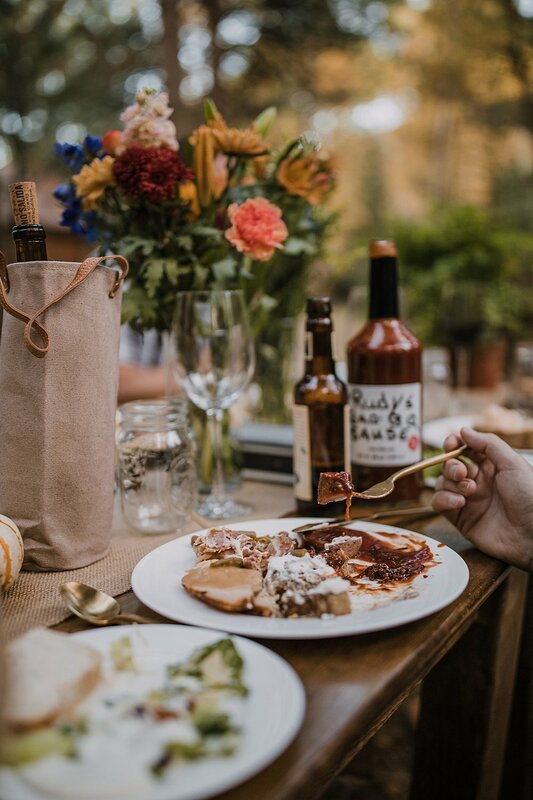 You can take the girl away from Oklahoma but you can’t take the Oklahoma out of the girl - BBQ is still one of my favorite food choices from back home, I was so excited to join in! The celebration began as thanks was given to God and the wine came uncorked! Each person shared one thing they were thankful for for the past year as laughter and tears immersed the woods. A few white tailed deer walked amongst us and listened to the stories told, they must have thought we were quite intriguing with our food, wine, and friends. As the sky darkened and the stars began to shine, we all chipped in with bringing the plates back inside. 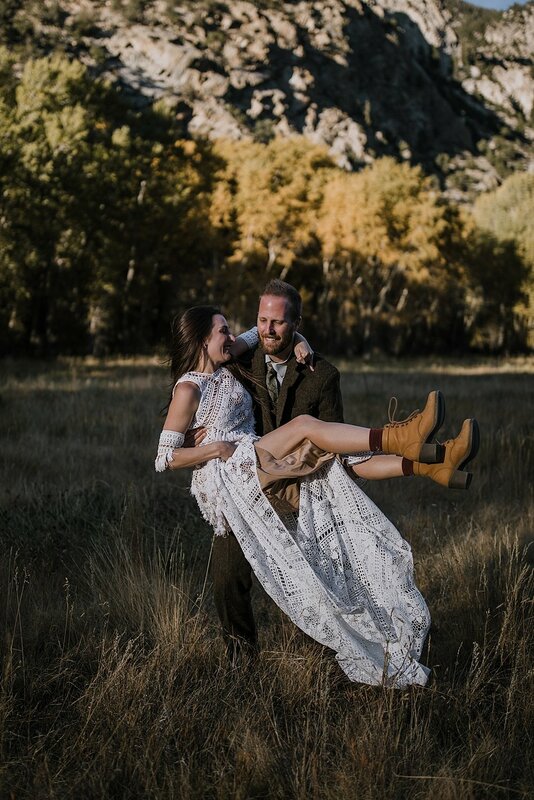 Hot cobbler and ice cream awaited us as the family moved upstairs to soak in the last of the celebratory evening with the elopement video from Brittany and Justin’s vows from Norway! As everyone settled onto the couch and the floor you could feel the warmth and love flow into the room. Justin worked to get their elopement video to play and I said my eventual goodbyes to the couple and the family. It is such an indescribable feeling to be included in celebrating with couples on their wedding day, even more special to capture the love that connected them and surrounds them in their tight knit community of family and friends. 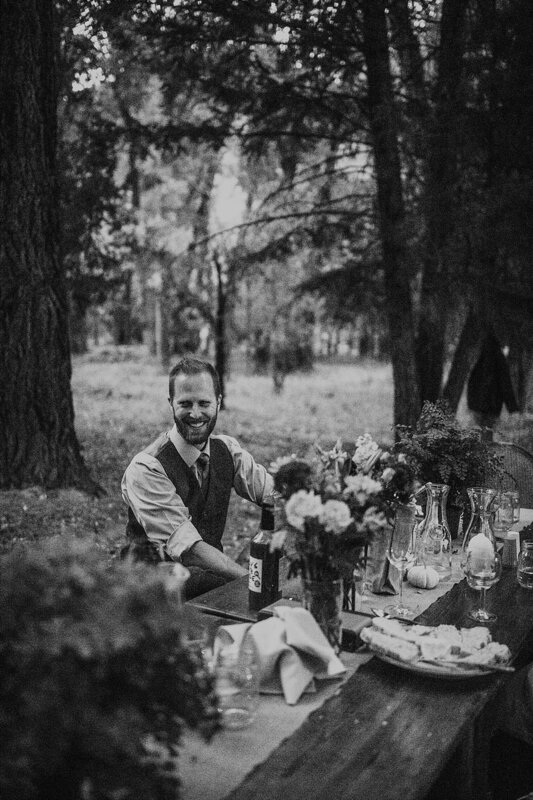 Thank you Brittany and Justin for bringing me into your circle and allowing me to capture your post celebration elopement!